Editor's Note: If you have seen the excerpts from A Boy at the Hogarth Press, Richard Kennedy's illustrated memoir of his coming of age in Virginia Woolf's basement, you may be as taken as we were with the utter charm that this man's pen wielded, both in drawing and writing. Through good fortune and a little gumshoe, we were able to track down Richard's original publisher, John Randle of the Whittington Press in England. John's is one of the most celebrated artisanal presses still in existence, his letter-press work the kind that rare-books dealers love to get their hands on. It was through John that we met one of Richard's daughters, Rachel. Recently we spent a March afternoon with Rachel and other family members at her Maidenhead cottage, agog over walls filled with her father's artwork. Besides being a well-known illustrator of children's books, Richard also worked in oils and watercolors. His work, so full of life, welcomed you into his canvas as warmly as Rachel welcomed us into her home. That was when we realized that reprising A Boy at the Hogarth Press would not only bring smiles to a whole new audience; it would also be a tribute to a man who, though he died in 1989, is still alive in the hearts of those who treasured him. What follows are John Randle's reminiscences of his good friend Richard Kennedy. 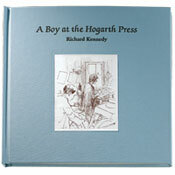 Richard Kennedy went to work for Leonard and Virginia Woolf at their embryonic Hogarth Press in 1926, at the age of sixteen. He had no qualifications - indeed his very lack of them had caused his Uncle George to ask his friend Leonard Woolf if he could find employment for his young nephew. Thus was Richard propelled into the strange, incestuous rock pool of Bloomsbury life, and the illustrated diary he put together forty years later gives us a vivid picture of its inhabitants and their eccentric ways. As a fly on the wall in the basement at Tavistock Square, the Woolfs' London home where they ran their Hogarth Press, Richard made the tea, printed book-jackets on the treadle press, and helped Virginia to set type. He was of no consequence to the mandarins of Bloomsbury, hence they took little notice of him. Yet his apparently vague exterior hid an acute observation and a memory unusually retentive of dialogue and detail. The genesis of A Boy at the Hogarth Press is inextricably bound up with the beginnings of the Whittington Press. Meeting Richard in 1964, when I had just started my first job as production assistant at the small but typographically distinguished London publishing house of Ernest Benn, was the catalyst that six years later brought into focus some hazy notions of starting a hand-press in the country and printing one's own books in the way one wished. Richard had come in with a portfolio of drawings for a series of remedial readers we were doing. I was immediately struck by the somewhat distracted air of the artist, but even more so by the fluidity and sureness of line in his drawings. Although he never seemed to size up his drawings accurately, after reduction they miraculously always fitted the allotted space exactly. We found we had certain experiences in common. We had both been educated (neither of us very successfully) at Marlborough College, a boys' boarding school in Wiltshire run on distinctly traditional lines. His father had been killed in France during the First World War when Richard was four, mine in the next war on the India/Burma border when I was two. Chatting over a glass of beer one lunchtime, Richard told me of his time at the Hogarth Press - how the drains smelt at Rodmell, the Woolfs' Sussex cottage, how Virginia rolled her own cigarettes, and how Leonard was in the habit of 'withering' his long-suffering secretary, Mrs Cartwright. It was a refreshing antidote to the more serious studies of Bloomsbury then beginning to proliferate, and I told Richard he really should write it all down. It was not until some years later that he finally put pen to paper. The manuscript for A Boy at the Hogarth Press came just at the time my fiancée, Rose, and I were making plans to start a press in the Cotswold village of Whittington. Her first task was to sort out Richard's intriguingly holistic manuscript (now at the University of Minnesota), in which the illustrations often blended tantalisingly with the text. We printed the book in 1972, over a year of weekends of escape from publishing jobs in London, on an 1848 Columbian hand-press. It was set in 12-point Caslon type from Stephenson Blake, the last of the English type founders. It all brought back happy memories of the school press at Marlborough, where twelve years earlier I had first become fascinated with the processes of setting type and printing on a hand-press. A Boy at the Hogarth Press turned out to be a minor classic, and established Richard as one of a handful of writer-illustrators who could successfully combine both disciplines within one book. Richard himself was something of a surrogate father to the Whittington Press. Not only did he get us off to a flying start by providing a best seller for our first book, but he was a constant source of stimulus in other ways, as with the manner in which he set about illustrating a book. Unlike most artists, he would send along a mass of drawings, or 'rushes' as he would call them, seeing himself as the cameraman and the publisher as the scissor-wielding director who would trim out the bits to be used. In this way maximum harmony could be achieved between text and illustration. With Richard's help we broke out of the constraints of the type margin and allowed his wonderfully fluid line to wander all over the page. Richard died in 1989. He was a man of great humanity and kindness, with a strong sense of the injustices of life suffered by the less privileged. He also had a rare talent for friendship. Many will be grateful to him for the encouragement he so often gave to their own projects, and for his complete openness of mind, perhaps in part a legacy from his Bloomsbury days. © 2006 John Randle. Excerpted from his introduction to the Levenger Press edition of A Boy at the Hogarth Press.